No use fighting it. Colorful floral prints are in. Most shop windows are blooming with florals weather it be large brightly colored prints, embroidery or patches. But flower prints are not that easy to wear, there is a huge possibility that the nice dress would look “granny-ish” once worn. That being said, I do not have florals in my closet. I do have floral inspired earrings though. When you tell me floral, this is all I have. (unless you count chinoiserie toile as floral then, I have two florals) I tend to go safe when it comes to following the trend. -unless I really really dig the current trend. embroidered floral on dark chambray polo – my first attempt at floral. But when I saw this picture. I know I need to get one. Hello to huge bright floral prints! I got this bold floral on gingham print dress because Pia Wurtzbach is looking good wearing it! Shallow reason, but to be fair I recently watched her life story so maybe that was it? I am going to wear mine with Fitflops!-Photo of Pia from the internet. Quickly ordered one online and discovered that I lack the height. So, I will be taking the dress to the alteration shop to get it shortened to (my) knee length. Because I have started with one floral dress, its going to have more for company. I got another floral dress, shorter this time and in a more tropical vibe. 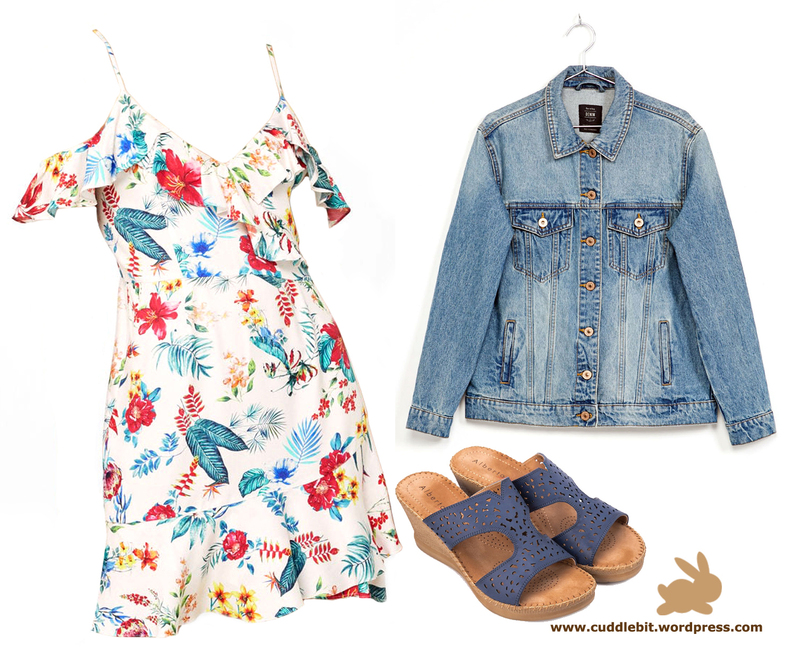 Taming the florals with a denim jacket and keeping it all together with wedges. I have also been contemplating on getting more floral pieces. Might as well join in the fray. *I get to watch the first episode of Game of Thrones season 7 later! yey! -Will be posting about the new additions to my Funko Pop collection soon. Categories: dresses, fashion, Uncategorized | Tags: cake dress, chambray, Fitflop, florals, gingham, kamiseta, mango, miss universe, pia wurtzbach, zara | Permalink.